I started out using the same roads as my trip to Fairview Peak on Labor Day. After passing on the east side of Grass Mountain, I continued on 5850 to Forest Road 38. On the way I got this view of Sisters. The upper seven miles of Road 38 are well graded with very few potholes, but covered with a layer of loose gravel which makes for rough riding. 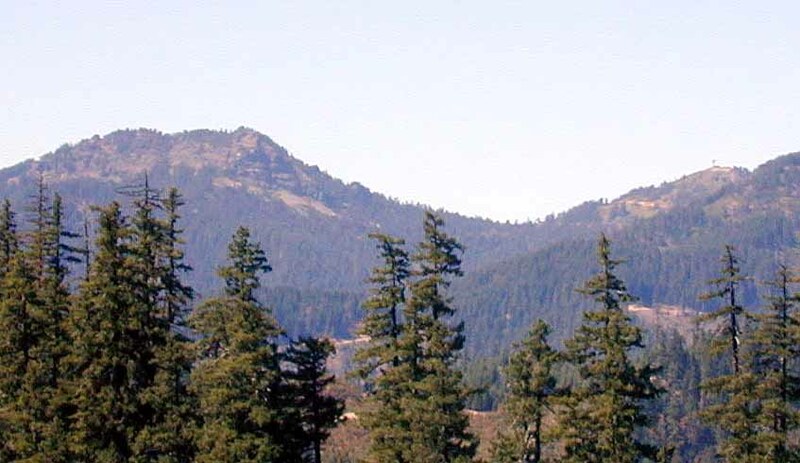 Here's a view of Bohemia Mtn and Fairview Peak from that area. You can just make out the tower on Fairview Peak (to the far right). Once I got to the pavement it was smooth riding all the rest of the way down the Steamboat Creek valley. I stopped at the Steamboat Falls Campground to have a snack, and to check out the Falls. All I saw there was a small, unimpressive cascade by some large piece of concrete. I read later that there's a fish ladder there. Perhaps that's what the concrete thing is. I thought there might be a larger falls upstream a ways, but didn't investigate as it was getting late, and I still had fifty more miles to go. There are some pretty nice swimming holes there which were well populated on that warm day. A few miles further down Road 38 I stopped at the Canton Creek Campground to refill my bottles, then doubled back about a quarter mile to pick up the Canton Creek BLM Road. This got me back up over the Calapooya Divide to Clark Creek Road, and on to home. 112 miles (20 unpaved), and 7800 feet of climbing. No mechanical problems or flats.